Noontime show wars is not only all over the television shows of two giant TV networks, it is also about the power of social media and the growing fandom. 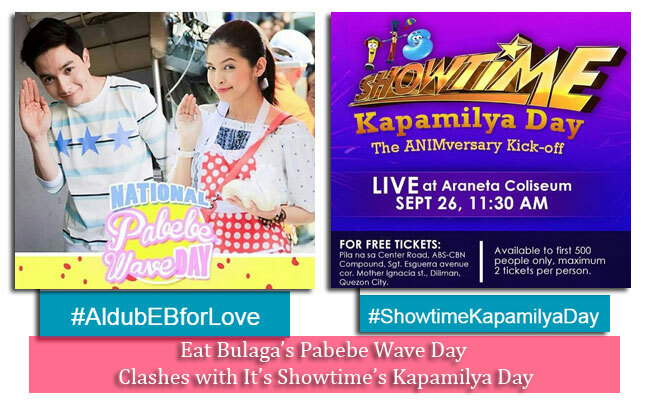 It’s Showtime declared September 26 at Kapamilya day while Eat Bulaga declared their National Pabebe Wave. Alden Richards had been invited to the de Explorer’s house for the first time. AlDub Nation had been looking forward to the split screen tandem’s second lunch date and this time their hopes were not crushed as the date had been successful. Despite Lola Nidora’s strict rules, the two were able to talk with each other have some ‘kilig’ moments and even feed each other. On the other hand, the Kapamilya network won’t back down so easily. As part of the 6th Anniversary celebration kickoff of It’s Showtime, the network harnessed their most popular love teams in the stage of Smart Araneta Coliseum: James Reid and Nadine Lustre (JaDine), Daniel Padilla and Kathryn Bernardo (Kathniel), Liza Soberano and Enrique Gil (LizQuen), Kim Chiu and Xian Lim (KimXi), and Coco Martin and Julia Montes. It has been years since the two networks had been battling for the viewer ratings for their respective noontime shows, but this time it seems to be the most historical of all. Eat Bulaga would dominate the mainstream then It’s Showtime will be able to go ahead for a while, now it seems that the GMA Network had struck gold in AlDub. AlDub tandem only started in July, yet its fandom had been steadily growing globally. They even made history by making more than 25 million tweets using one hashtag. It was evident that the Kapamilya Network had been threatened as every day Eat Bulaga’s rating soared high together with the fans’ millions of tweets. Soon, It’s Showtime seemed to have found a way to neutralize the dilemma through Angelica Yap, known as Pastillas girl. However, Eat Bulaga won’t let their rival show get up so easily. Every week, they put their viewers at the edge of their seats as the kalye serye story unfolds. This seems to make the fans ask for more. While the rivalry is already felt on air during the shows, it reverberates in various social media. It even captures the attention of other countries worldwide. Many are also baffled by the phenomenon AlDub had created and only time will tell until when it will continue to reign among the Filipino people.